Local perspectives of free legal aid provision in the region. Have a look at the Triple A Regional Conference draft agenda. 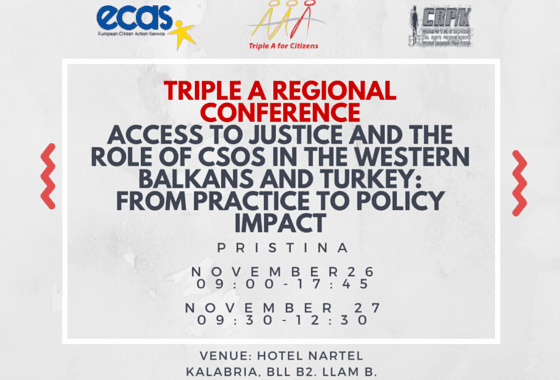 Triple A is a project focusing on improving access to Free Legal Aid, Information, and Advice services in the Western Balkans and Turkey. In early 2016 advocacy campaigns will be launched in each country of the project: Albania, Bosnia and Herzegovina, Kosovo, R. Macedonia, Montenegro, Serbia, and Turkey.